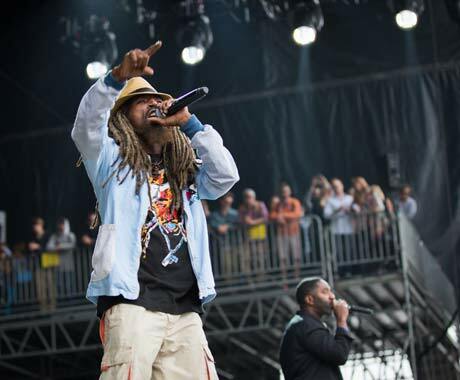 One of few hip-hop acts at the Outside Lands festival, Jurassic 5, brought their positive vibes to thousands of fans. Only recently reunited after breaking up in 2007, the outfit announced a tour in 2013, kicking off at Coachella. The Jurassic 5 show was an old school hip-hop dance-a-thon. L.A. rappers Charles Stewart (Chali 2na), Dante Givens (Akil), Courtenay Henderson (Zaakir), and Marc Stuart (Mark 7even) love being on stage with each other and have incredible synergy performing together. The highlight of the set was a ten-minute interlude by DJ Cut Chemist and DJ Nu-Mark. DJ Cut Chemist played a portable guitar-like turntable. DJ Nu-Mark played a sample machine constructed from records on his chest like a sort of hip-hop washboard meets the 90's toy "Bop it." The DJ's improvised beats including scratching with a giant two-meter square turntable that was the centerpiece of the Jurassic 5 stage set-up. The old school feeling didn't stop, including performance of the tracks "Concrete Schoolyard" from the 1998 record Jurassic 5 and "Jurass Finish First" from 2000's Quality Control. The long-time performers attracted a slightly older audience at Outside Lands. From teaching the audience dance moves to "occupyin' the drums, takin' 4 MCs and make them sound like one," (to paraphrase "Improvise"), Jurassic 5 were an audience and festival favourite.